Total Workshop search results: 9. Displaying Page 1 of your woodworking search phrase BABY CRIBS. The plan says: This sturdy play pen has been designed for use indoors and out. The legs have been made long to keep the pen bottom above damp ground and drafty floors, and to prevent baby from retrieving toys which they have thrown on to the ground for floor. After removing the pen bottom you can fold down the sides to a thickness of 8 inches, compact enough to carry in the car trunk. 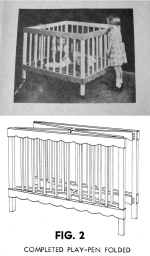 This pattern shows complete details for building the play pen. The bulk of the parts are in multiple duplication which simplifies the job of laying them out. Build this beautiful heirloom baby cradle. Construct from the wood of your choice.